Almost let this lunation slip by me. Busy again. That said, the best analysis I have seen is by Lance Ferguson of Skywatch Astrology. I adopt his analysis as my own. A confusing Mercury Neptune square kicks on the caution lights Monday morning. Exact at 12:41 PM, this marker promotes idealism ahead of reality, and in this mindset some folks will make some really bad decisions Monday morning. Errors, misunderstandings and deceitful communications are all more likely today. 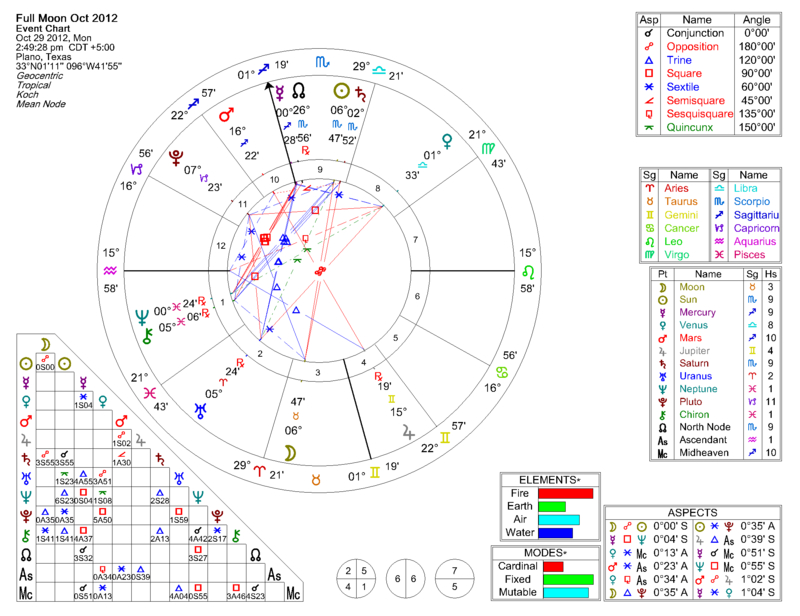 We also note a few other “interesting” squares applying, particularly Venus (Libra) Square Pluto (Capricorn). Potential for another little financial shakeup by the end of this week or early next week? Here I am writing to you once again. Thanks for co-operating the last time. I got carried away and wrote too much. I believe Saturn has majorly started effecting my life from 4 Aug 2012. I guess, it will stay so for the next 7.5 years. As they say according to Indian astrology, it is called “sadesati”. It is also said that the first 5 years will be worse and last 2.5 years will be good. My marriage is going thru a rough patch. I have started to study masters. 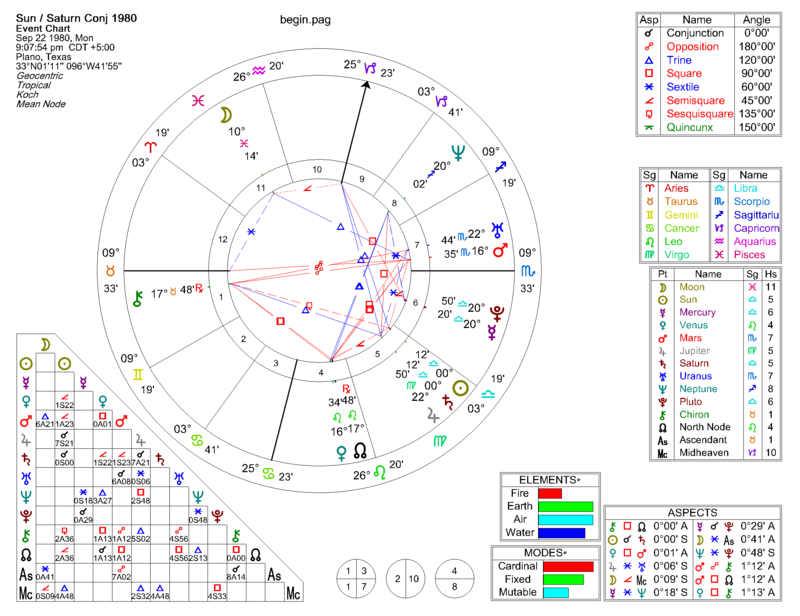 My DOB is 21 Feb 1979, Wed, 04.15 (AM); Time Zone: GMT+5.30hrs , Ahmadnagar, (Latitude: N 19° 5′ 23.9676″ Longitude: E 74° 44′ 40.308″); Asc: Sagittarius. 1. Will my marriage last? Will I get out of this? Is there a separation or divorce? 2. Do u see any other association right now? How long do u see this association? 3. Will I switch job in the near future? Will I make more money as compared to current earning? 4. Will I always have a source of income? 5. Are there any indication of migrating to a foreign country? If yes, when? 6. Are the next 5 years troublesome? 7. When is or when was the best period of my life? Is Saturn always causing neagtive impact? Ginni is a few years past her Saturn return, and, among other things, that means that she has become an adult in astrological terms. As is true for the majority of us, she likely had a turning point between the ages of 28 and 30, and this may be when she initiated the marriage in question. More recently, between 12 and 24 months ago, Saturn touched her natal Pluto. This is a highly transformative event, and she could not ignore what happened at this time. (This would be our second choice for guessing when her marriage occurred, unless she had it planned by an astrologer.) She has since started graduate school and is unsure what direction her life is heading. The next “big” event will be when Saturn conjoins her natal Uranus. We expect this to happen in the next 12 to 18 months, probably towards the end of 2013. If she could have completed her Masters degree by that time, then this would be good. The events that happen will likely take her by surprise, and they will make completion of a program difficult if not impossible. If graduation is targeted for Spring of 2014, then she needs to have contingency plans in place, such as the possibility of independent study if needed. One benefit of this period is that she can develop very “strong” ideas at this time. If she collaborates with a professor to produce publications that list her as a co-author, then this could be very much to her benefit. After this, she has some peace from the effects of Saturn until it comes to touch her moon (this is a few more years away). To be certain, that is another difficult period, and can be associated with the end of a marriage (if her marriage has survived so far) or the death of a parent. Also, Saturn is beginning to “set,” and she needs to find a “home” in terms of her career (and retirement planning) by this time. 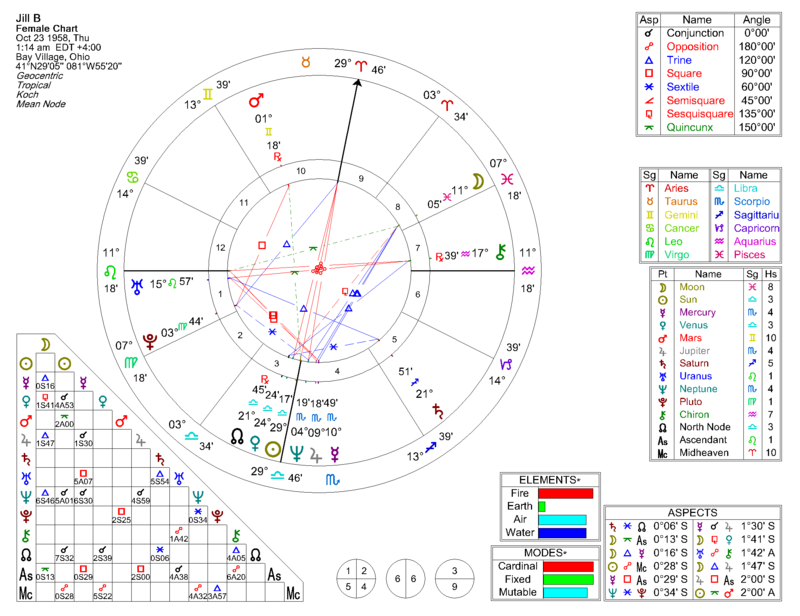 I read that the North nodal axis is moving into Scorpio. That will be my first house. Since i am also heading for my Saturn return , Do i to continue doing my Job? Or move to university to study? Can you see which country will use my potential? Or totally change my nature of work from Information Technology to business or management side? I always liked living in Norway. As of this writing, you recently had your annual Solar Return. Some of your questions have been answered by now, and my analysis may be moot. Each year, the 30 days preceding our birthday, our “Solar 12th House,” proves to be a period of difficulty. We make mistakes and often bad choices, the “self undoing” associated with the 12th house. You have likely been through this recently. Most of your chart is below ground. Regardless of anything else, this leaves you often secretive. Indeed, one of your problems can be enmeshment in the “gossip network.” Be careful of letting others make your decisions for you by whispering half-truths into your ear. Often they will cut you off from your best opportunities, and, tragically, you will believe that they are doing you a favor as they do so. Pick your friends carefully. With the Sun at 29 degrees, much of your life feels like fate. You ARE able to make your own decisions, but you have to make an extra effort to be a truly autonomous decision maker. You are faced with powerful struggles in this regard, and the 8th house Piscean moon reveals secrets to others that you would rather not be revealed. It also creates a danger that you will squander any inheritance that comes your way. Prudence in this area is especially important for you. If you inherit cash, consider rolling it into a retirement fund or some similar approach rather than “taking a vacation” etc. Now, to your specific questions. You have Pluto in the 1st as well. Needless to say, this is difficult. You simply cannot stop transforming yourself, and the experience is not always pleasant for yourself or anyone near you. As to whether you should attend a University or go to Norway, I cannot quite see from this chart. Both of those would have to do with 9th house involvement, and your 9th house appears to be intercepted. I question how much weight to put on interceptions, but they do make interpretation a bit more tricky. What I can say is that transiting Uranus is dancing about your 9th house cusp. And, Uranus is obviously important to you. So, this is your window to do something like University study, travel abroad, or other 9th house activities. I will refrain from giving you specifics because I do not know enough about your personal situation. But, you do have a window here, and it should be open for roughly a year or so. Choose wisely. Taking a peak at your US map (below), I note the following: Boston = Mercury (very good for education); Philadelphia = Uranus (amplifies your 1st house issues; good for ideas & technology but maybe a little dangerous); Virginia & North Carolina: Coastal Regions = Neptune (good for poetry and photography, should you ever turn that direction; amplifies your Moon & any related issues). We think so. From what I can tell, “you” (the visitors) are still interested in the topic. But, if you would like to hear about other topics, please comment & let us know. By the way, we like this commentary on the 2008 election. So, what does that mean? 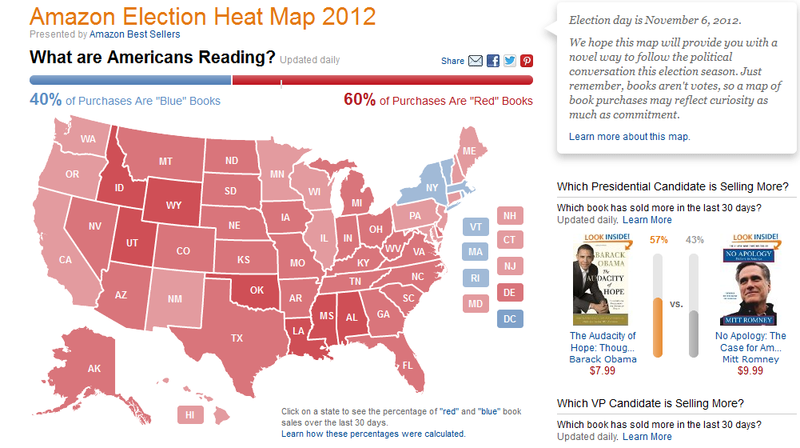 Is the country really Red? The (other) polls say otherwise. Maybe what this map really means is this: Republicans tend to read more paper-based books whereas Democrats take in their information from other sources, such as television (and the internet). 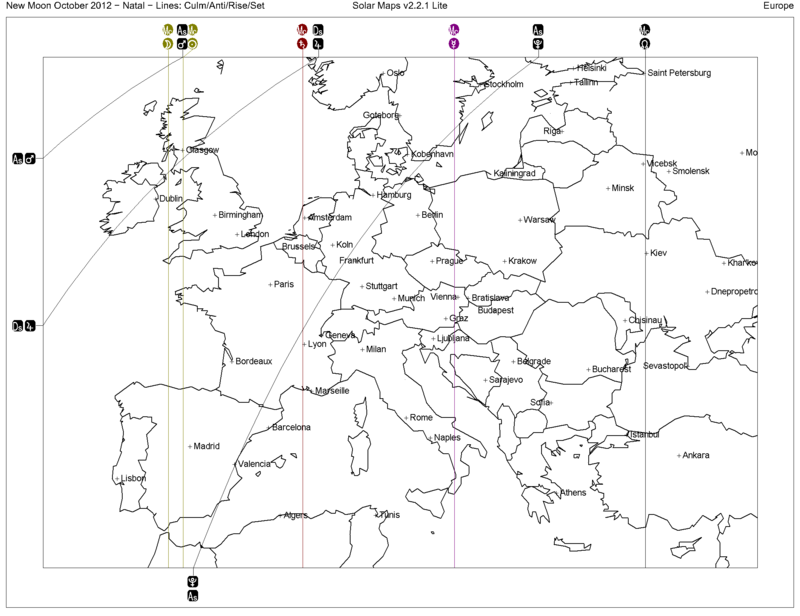 Is the map real, or is it skewed? Are we seeing a reflection of a population moving away from reading? We first note that, unlike the election of 2000, the Moon is not void. It is in Leo and applying to a square to the Sun and waning. As is true with all U.S. Presidential elections for anyone who is currently living, the Sun is in Scorpio (in early November). But, unlike most other elections, the Sun has recently conjoined Saturn. Although recounts could happen, we do not expect them. We do think that the waning Moon may signal the end of an era of some kind. That is, after this term, the United States will be a very different place from what it has been like for a number of decades. We will go further and argue that this era started the last time that the Sun conjoined Saturn in Scorpio, roughly 45 days prior to the 1980 election. The Sun is six (6) days past its first conjunction with Scorpio in (approximately) the past 30 years. Specifically, the last time the Sun conjoined Saturn (for the first time after entry) was September 22, 1980. That was a bit before the Reagan election of 1980. That election was a rare landslide election that went against an incumbent (Jimmy Carter). Specifically, a pro-business conservative Republican governor upset a liberal Democrat President who had problems in the Middle East. Could that happen here? The polls currently say no. And, we tend to agree with the polls. This is because of the position of the Moon. 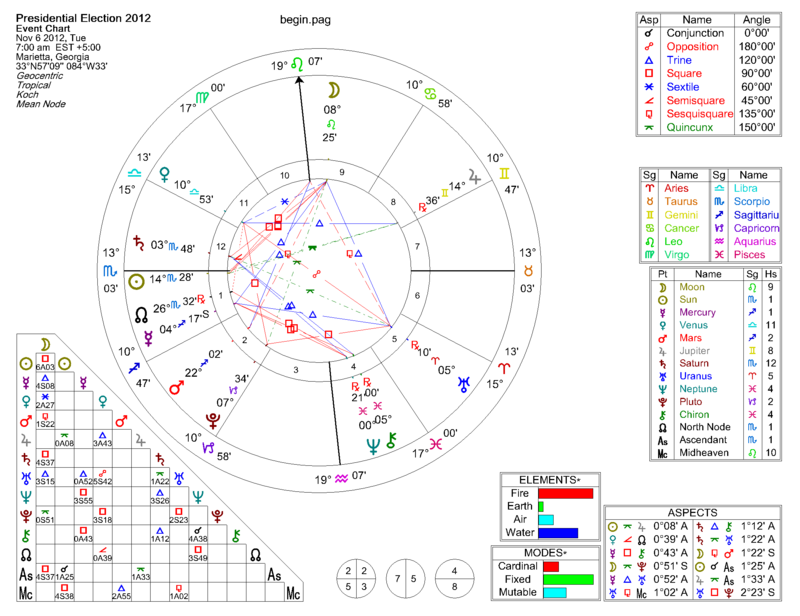 Specifically, if we look at the Moon in Romney’s natal chart, it is placed between Saturn and Pluto. 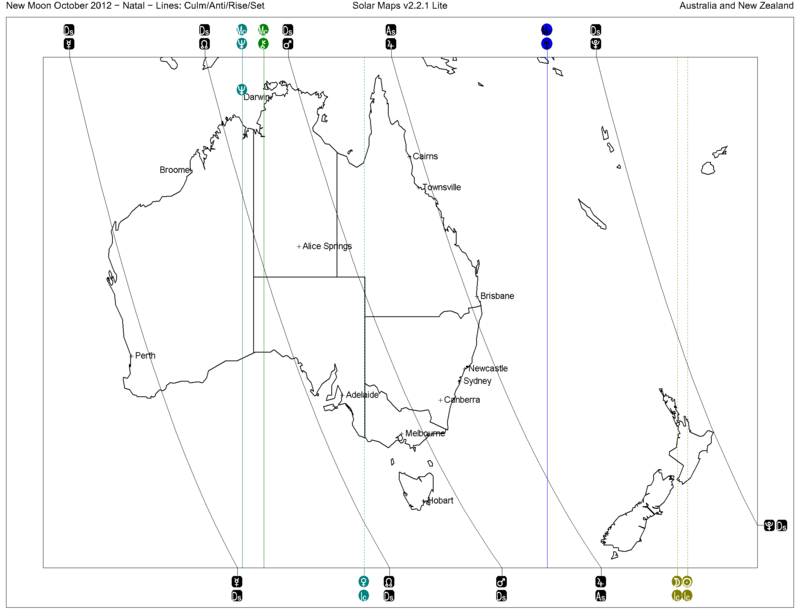 *IF* he is elected, then this will have an interesting symmetry with the Diamond Pattern of the 2012 Solstice. 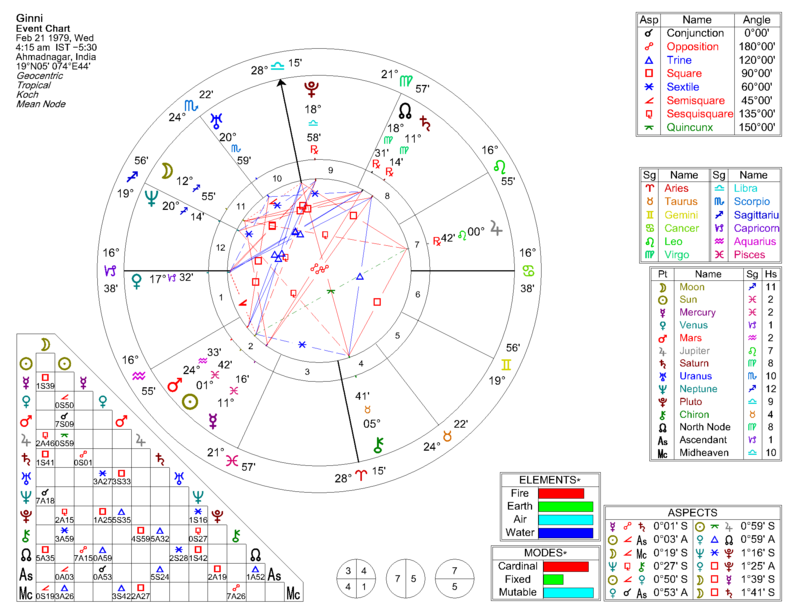 But, Obama has the Moon conjunct Mercury, a bit more favorable as far as aspects go. We think he will win. But, Mars & Pluto in the second house say that the last four years were just the prelude, the beginning, of the deep fiscal issues that the nation, and the world, will face in the next four years. Sadly, we have not seen the worst of it yet. And, we cannot spend our way out of it. And, some comparisons of Obama to Jimmy Carter are being made. Fox News wrote an article called “Obama is Jimmy Carter 2.0.” Fox is rather conservative, but what about the Washington Times? And, BEFORE he was elected, the New York Observer made a set of Obama / Carter comparisons. Assuming that you are old enough to remember who Jimmy Carter was, and why he was voted out of office, is that a fair comparison? 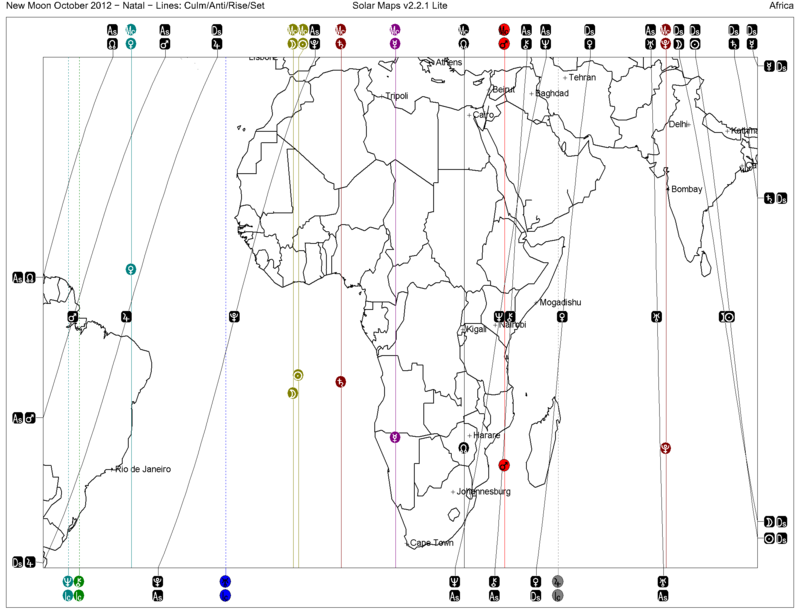 What will be interesting will be to see the mood of the country when the Sun / Scorpio conjunction happens this year. We would not be surprised to see an event of some kind between the upcoming Full Moon and that conjunction that might cause some kind of shift in the sentiment of the country. 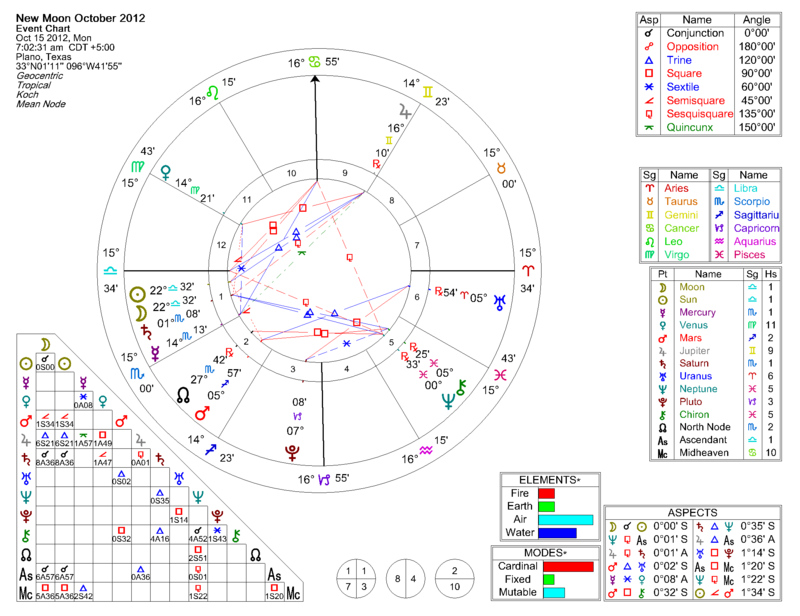 And, Jupiter has left its contact with Obama’s natal moon and is applying to a conjunction with Romney’s natal Uranus. A surprise could happen. Often, the transit of a Generational Planet (popularly called an “Outer Planet”) does not have a particular event or turning point associated with the precise moment that the transit occurs. The significance of the shift shows in the first lunation (and the first several). 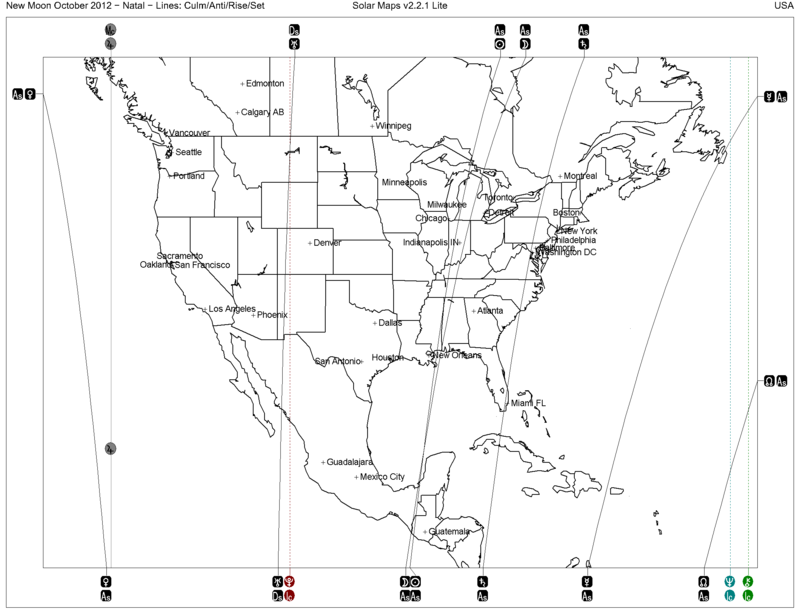 Upcoming is the first of these, the New Moon on Monday October 15th. As we typically do here, we will present the charts with only minimal interpretation. We provide the “Beginners Chart” from Solar Fire with the idea that you will take our general comments and fit the details to your particular situation. That said, we do have a few comments on this chart. This chart appears to be highly activated in the United States. Here in (Plano) Texas, we see the Sun, Moon, Saturn and Mercury in the 1st house. That is a strong indicator of work needing to be done, and the emphasis here is on the word WORK. Mercury and Saturn, together, indicate a need to pay attention to details. Mars is in the second house, and the historical experience of this astrologer is that this means that a great deal of money will be spent. When the reckoning comes, “when it is all over,” a tendency to ask “where did it go?” will be dominant. If you can possibly avoid it, avoid spending money at this time. However, you may not be able to avoid it. Pumping money into the economy for the sake of the election is a bad idea this time, and we will all feel it later. Senators and Congressmen would be wise to avoid “pork” at this time. Neptune and Chiron are retrograde in the 5th house, and this means that big dreams will come true for only a few at this time. We will certainly HEAR about the lotto winners (both literally and metaphorically), but very few of us will have the winning ticket. Again, the smart thing to do at this time is work hard, and pay attention to detail, in whatever your field of endeavor may be. Only two planets are above ground at this time for the U.S. and the Western Hemisphere. This means dealings with people will tend to be underground, too, with a fair number of “back room” deals. Some of us will be caught on the wrong side of these. (1) If it sounds “too good to be true,” then it probably is. And, (2) this is one time where they may REALLY be plotting against you. The only above ground planets are Venus and Jupiter roughly in a square. This will lead us to “feel good” and, again, to tend to spend money we should not (or do not have). Watch out for those credit cards! They are dangerous at this time. A few of you may be considering returning to school at this time. This should help with the decision: if grants and/or an assistantship will pay your way, then go (as long as your heart is in it). If you have to take out loans to pay for most or all of it, then do not go. This is NOT a time to incur debt. Here is a map of Africa and the Middle East. We see a Pluto line (death, destruction) through Western Africa which obviously corresponds to problems with flooding currently happening. We see a crossing of the Neptune and Chiron lines in the Red Sea which likely corresponds to the Oil & Gas find there recently by Saudia Arabia. Don’t be surprised if we see some problems with this (Neptune is ok with it, but Chiron requires a “healing” of some kind in relation to this). A strong risk exists that (oil) exploration here may have the risks of the 2010 BP oil spill. 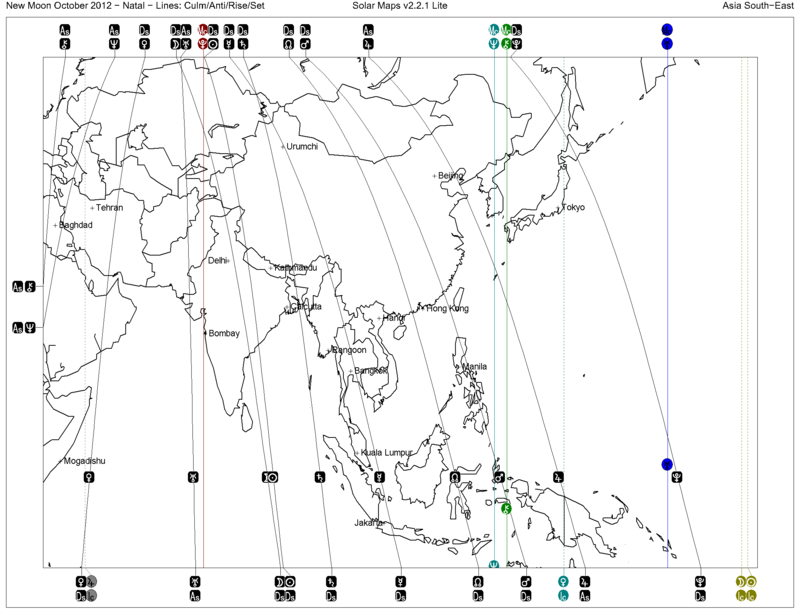 Much (planetary) activity in this part of the world, and you can explore the meanings of the lines yourself as an exercise. Darwin has some issue of “healing” to do, and it might have to do with environmental issues if not reform of some kind in healthcare and hospitals. Could easily be both. The Eastern Coast (I hope I have that right, someone let me know if I don’t) of Australia, including Sydney, does very well at this time. Do not be surprised to see this region of the world acquire a distinct financial advantage in relation to the rest of the world. The U.S. has good news and bad news. First, the bad news. 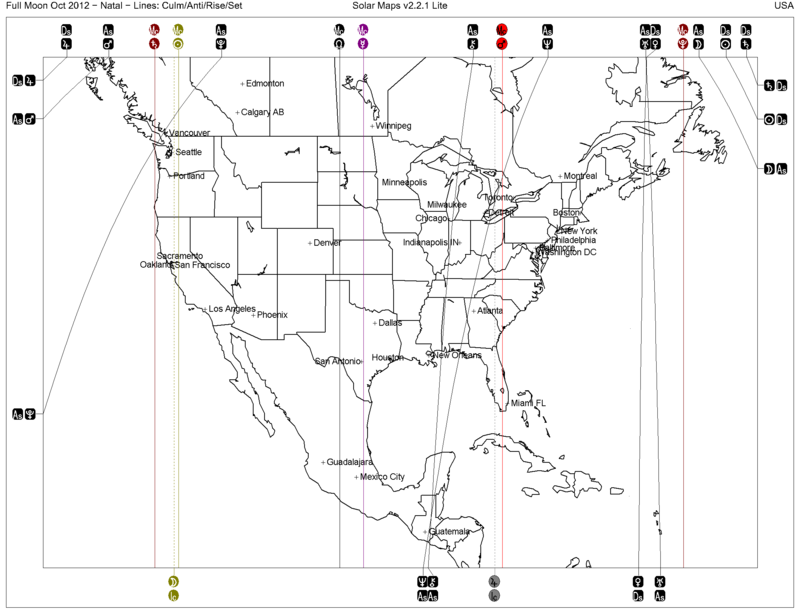 New Mexico, Colorado, and points north have a Pluto / Uranus crossing. This is also true for the part of Northern Mexico due south of New Mexico. This is a difficult and violent combination; transformation of this energy into something positive is not easy. We expect some kind of event, likely a violent one, along this line. 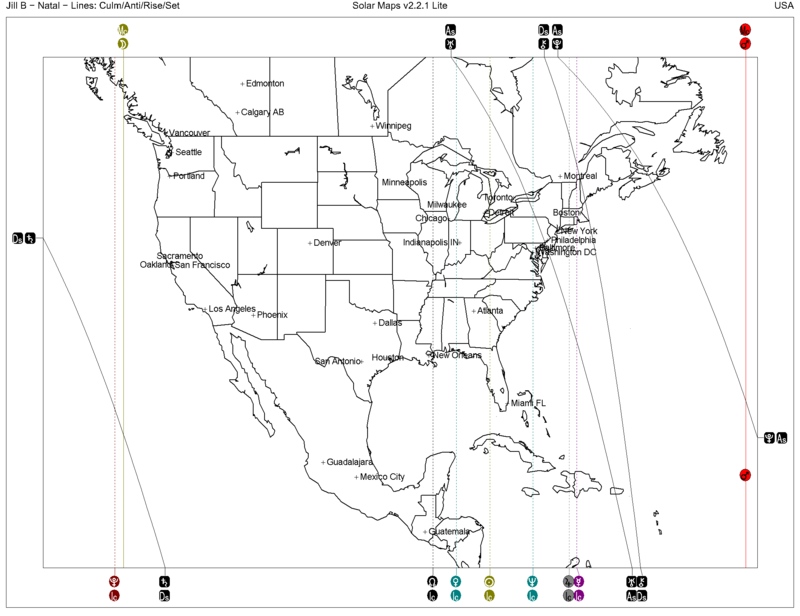 The good news is that much of the traditional South, including Mississippi, Alabama, and Tennessee, have the Moon/Sun line (they are conjoined at the New Moon) passing through them. This extends north through Kentucky, Indiana, and Michigan. To the south, it passes new New Orleans. These regions experience a powerful sense of renewal at this time. This afternoon, I had an opportunity to take a (long overdue) nap. After a few hours of dozing, I awoke to an intense and vivid dream. I dreamed that I was someone a bit like a consultant, to a group of people preparing to travel to South America. In the dream, the central topic of the discussion was something that seemed like it was from “Raiders of the Lost Ark.” The question had to do with how to translate an inscription. And, the inscription was Mayan and directly addressed the question of the upcoming Winter’s Solstice of 2012. The point, in the dream, was that the inscription had been incorrectly transcribed. The group was traveling to a particular place, as were other groups. But, as things turned out, this group would have the correct transcription. As I awoke, a scene from Raiders of the Lost Ark sprang to mind. In it, the heroes are racing against time. The Nazi’s have a copy of the medallion burned into the hand of one of theirs. They have translated from the wound, and are digging at a particular location. But, the heroes have the actual medallion. Turning it over, they look at the back. And there they find “Subtract one….” The Nazi’s are digging in the wrong place. Hope you are not a Nazi. Would not want you digging in the wrong place.